The son of a natural science museum director, Glen Johnson taught natural science, archery, and riflery at a summer camp while in high school in Angleton, Texas. "They loaned me out to other camps," says Johnson, who became a traveling summer camp counselor while attending six colleges in eight years. He completed a science teaching degree at Oregon State in 1987, then spent 11 years in Eugene as a sub teacher and a River House recreation guide. A photographer since age six, he launched a new career in destination wedding photography after his son Jade was born in 2000. "One summer, I had 23 weddings in other countries," he notes. "I spent only one week at home." His book Digital Wedding Photography-Capturing Beautiful Memories, published in 2006, has sold 50K copies. 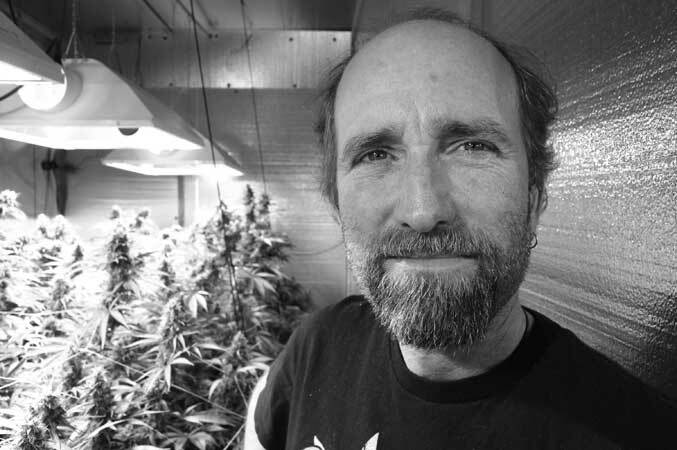 In 2010, moving into a newly rented house, he found a marijuana grow-room in the garage. "I turned it into a man-cave," says Johnson, but he later obtained an OMMP card and decided to give growing a try. "The scientist in me was intrigued." He studied, experimented, killed a few plants, eventually found patients by way of his doctor. He started a non-profit, Nature's Meds, and relocated to a warehouse space. "We're growing plants with less THC and more CBD," he says. "It's perfect for kids with autism or seizures. They don't get high." Learn more at naturesmeds.us.